Astronomers have discovered seven roughly Earth-size planets very close to a cool dwarf star some 39 light-years from Earth, including three orbiting in the star’s habitable zone where liquid water, a key ingredient for life as it’s known on Earth, could be present, researchers announced Wednesday. The record-setting star system is the first to feature three Earth analogues in the so-called “Goldilocks” zone of their parent star and the first to include seven such worlds overall. The discovery was announced Wednesday in the journal Nature. The intriguing star system was first studied by Belgium’s Transiting Planets and Planetesimals Small Telescope, or TRAPPIST, observatory in Chile where observations in 2016 indicated the presence of two and possibly three planets. NASA’s infrared-sensitive Spitzer Space Telescope, working with the European Southern Observatory’s Very Large Telescope, then spent 500 hours studying the star, confirming the existence of two planets and discovering five more, boosting the total to seven. “Not one, not two, but seven Earth-size planets,” marveled Michael Gillon, an astronomer at the University of Liege in Belgium who led the study. “This is is the first time that so many Earth-size planets were found around the same star. Furthermore, with three of them in the habitable zone. For comparison, he said, if Earth’s sun was the size of a basketball, TRAPPIST-1 would be roughly equivalent to a golf ball. The innermost habitable zone planet is roughly the size of Earth and receives about the same amount of light, possibly resulting in surface temperatures very similar to our planet’s. The middle planet in the habitable zone receives about the same amount of light that Mars does, orbiting TRAPPIST-1 every nine days. The outermost planet receives the level of sunlight one would experience somewhere between Mars and the asteroid belt. The planets may be “tidally locked” to their star, gravitationally held in place so only one side of the worlds face their sun. If so, the planets could host truly alien weather patterns, with strong winds and extreme changes in temperature. The planets also are very close together. Researchers said an observer standing on one world likely could discern clouds and other features on neighboring worlds, which could appear larger in the sky than Earth’s moon. 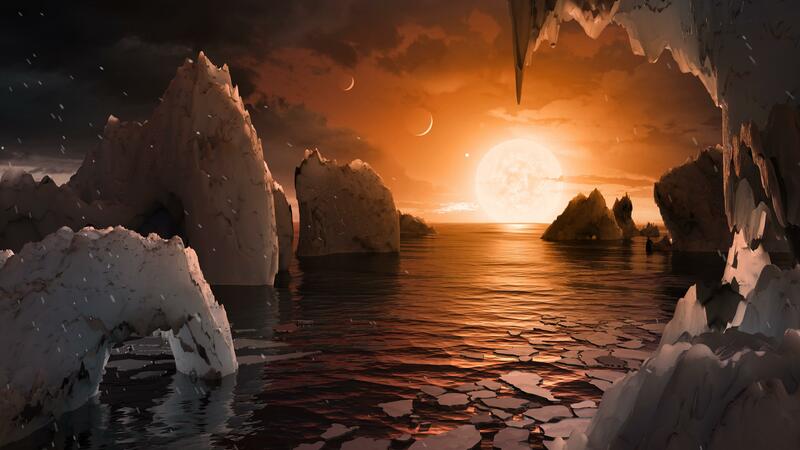 Additional observations are planned by Spitzer and the Hubble Space Telescope, which will focus on four of the seven planets, including the three now known to orbit within the habitable zone of TRAPPIST-1. Hubble observed the two innermost planets earlier, but found no evidence of the sort of hydrogen-dominated atmospheres that define worlds like Jupiter, Saturn, Uranus and Neptune in Earth’s solar system. NASA’s Kepler space telescope, which was built to look for transiting exoplanets, also is studying the TRAPPIST-1 system, collecting high-precision data that will help researchers refine their knowledge of the worlds discovered so far while being on the lookout for additional planets. And NASA’s James Webb Space Telescope, the $8.6 billion follow-on to Hubble that is scheduled for launch in 2018, also will study the TRAPPIST-1 system, spectroscopically studying atmospheric constituents and looking for telltale signs of biological indicators such as oxygen, methane and other chemicals. How far is 40 light-years away?